Have you seen anything cuter? Especially when it’s made for a class of 20 three year olds’ monster party??!! Xiaoliang certainly was proud of her daddy’s work,the teachers said she made sure each if her classmate had one monster and they were enjoying the cake. Eyes: Marshmallow (cut into appropriate size) and chocolate pearls. Fur: Dessicated coconut and blue coloring. Melt and brown butter slightly. Meanwhile mix flour, baking soda and salt in a bowl. In another (large) bowl, mix sugar and molasses. Add browned butter into sugar mixture and beat for 2 min. Add vanilla. Add egg. Beat for a min. Add flour mixture, stir to combine. Finally, stir in the chocolate chips. Form balls of dough using a ice cream scoop. Can freeze the unbaked cookie dough balls or bake immediately in a preheated 180deg Celsius oven for 12-13 mins. 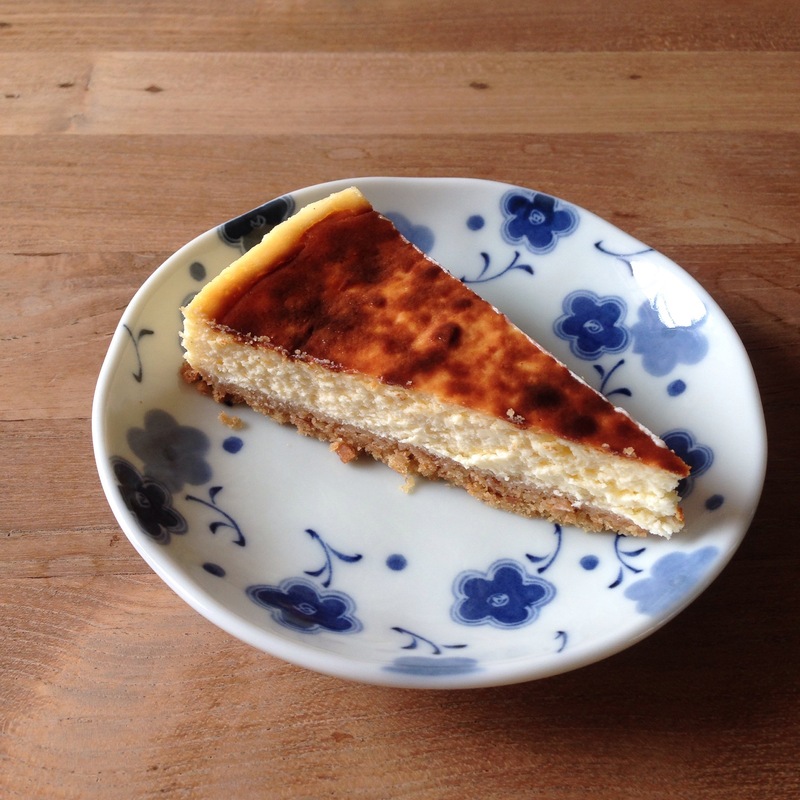 This entry was posted in Bake on April 30, 2015 by three3seconds. Sisterly love is cool, so are magic powers. Oh and a really stylish queen and the energetic bouncy smart aleck sister. This probably explains why the animation film Frozen is so popular worldwide. It’s been a year since it was released and it’s popularity obviously is pretty much unshaken. So here we have 2 sisterly cousins belting out (screaming) the frozen theme song ‘let it go, let it gooooooooooo” every now and than. Never mind if the audience is a willing one or if the situation is appropriate. 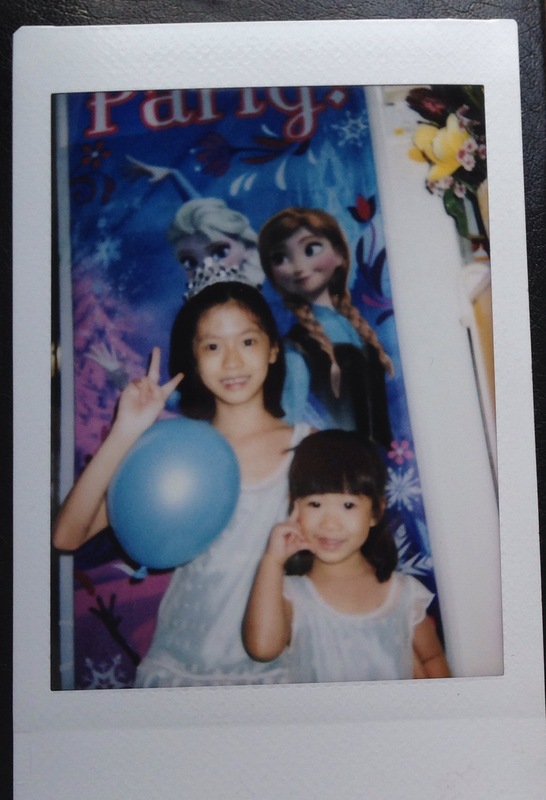 The self proclaimed queen Elsa and princess Anna always get their frozen fix. Melt butter and chocolate together over a double boiler. Set aside to cool. Preheat oven to 180deg Celsius. Combine vinegar and milk and set aside. Mix flour, cocoa, salt, baking powder and soda together in a bowl. Set aside. In a large mixing bowl, whip the eggs until frothy. Add sugar and whip for a minute. Add cooled chocolate and butter mixture and mix well. Add two-thirds of the dry mixture, stir to roughly mix. Add milk+vinegar, followed by remaining dry mix. Stir to just combine with no visible lumps. Bake in batches of 10. 17-18 mins. Melt white chocolate over double boiler, set aside to cool. In a large stand mixer, beat the butter for 3 minutes. Add 2 cups of icing sugar and beat for 3 minutes. Add cooled white chocolate and beat for 1 minute. Taste. Add more icing sugar and beat to reach desired sweetness. Add whipping cream and beat for 2 minutes. 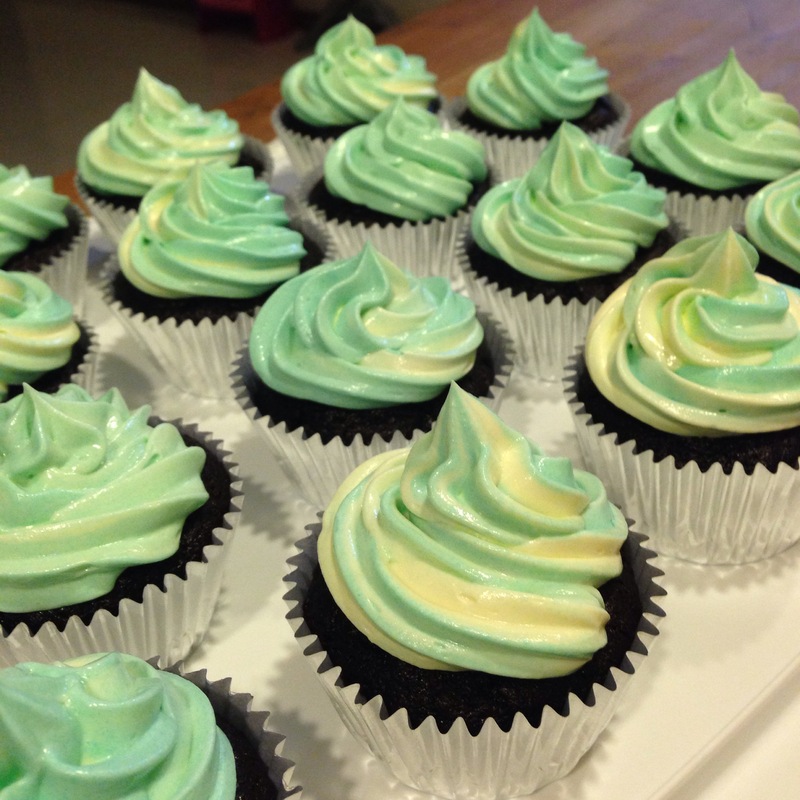 Use a star tip to pipe a swirl on each cupcake, doing a circular motion from outside in. 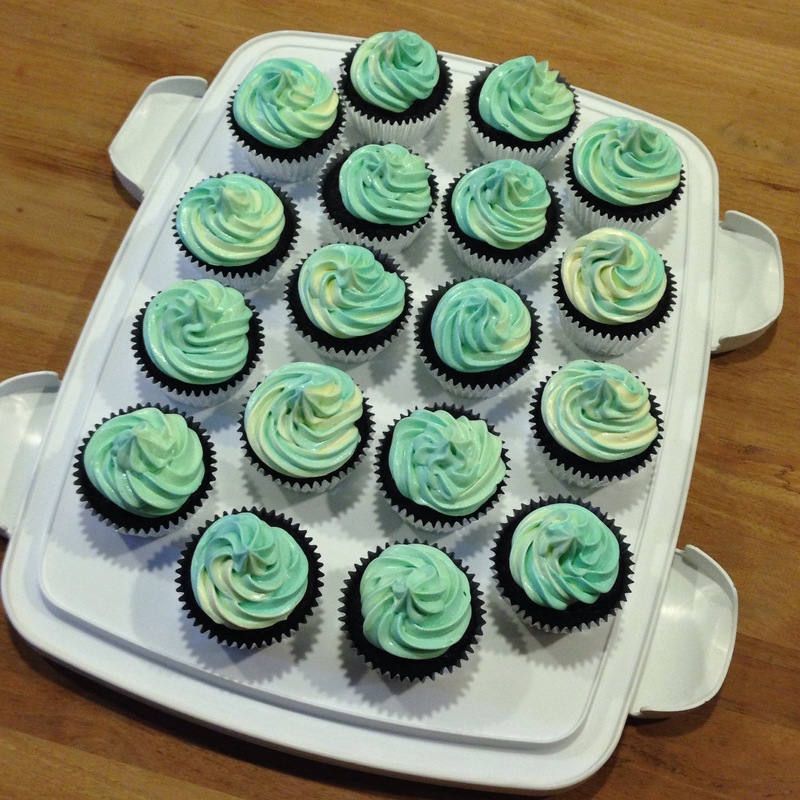 For alternating white and blue, divide the frosting into two. In one, mix in a little blue food colouring until the desired colour is obtained. Scoop a large spatula of each frosting into one piping bag and pipe. 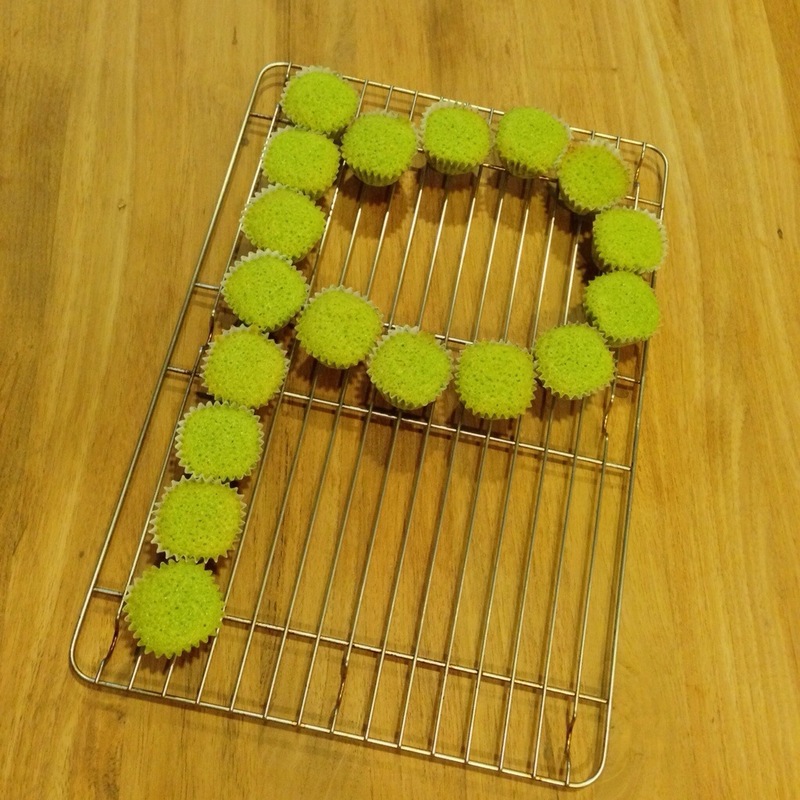 This entry was posted in Bake and tagged cupcakes, frozen on December 10, 2014 by three3seconds. This is a 2-stage recipe, best to start in the night, and bake on the following day. 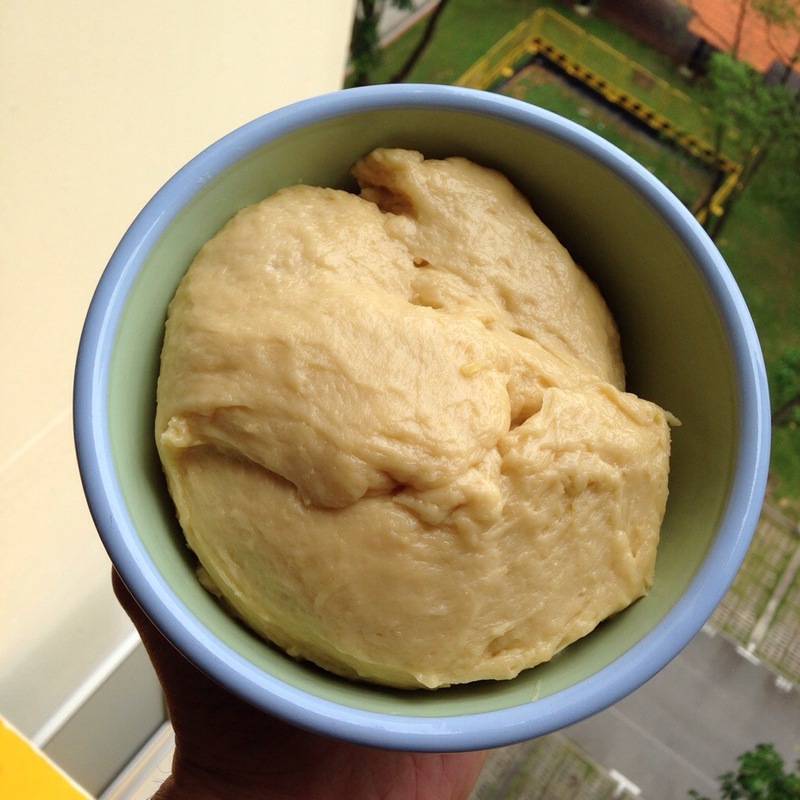 Mix flour, sugar, salt, yeast and water/milk in a mixing bowl of a stand mixer with dough hook fixed on. Mix well. While mixing add eggs one at a time. Add butter cube by cube. Keep mixing (I used my kitchenaid at speed 2) for 8-10 minutes until dough is smooth. Transfer into a medium bowl, cover with film and rest in fridge overnight. Take the dough out of the fridge in the morning. Allow it to sit for half an hour at room temperature. 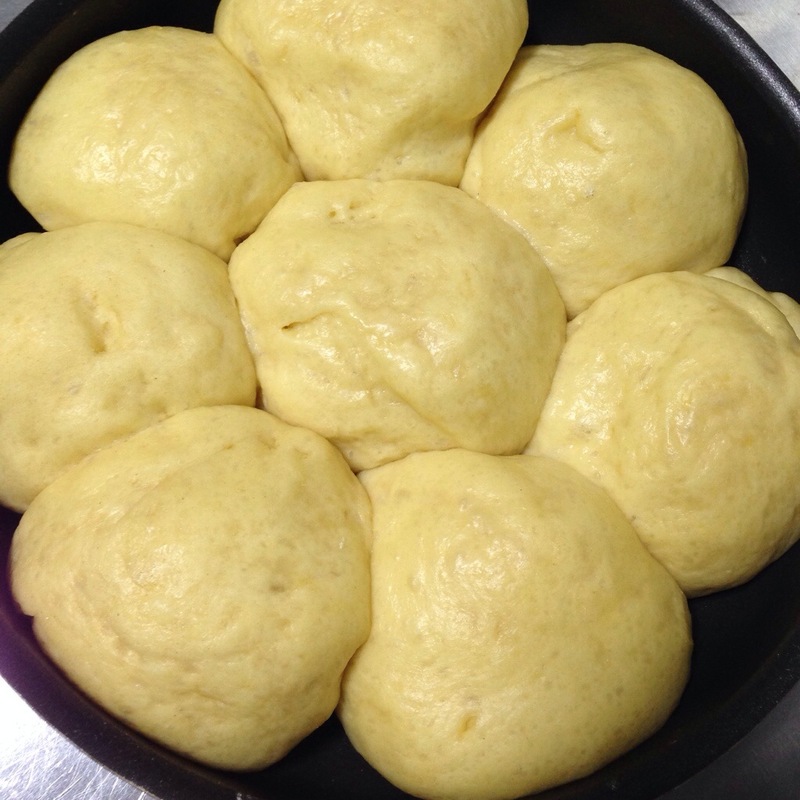 Form 6-8 balls of dough. Either put the balls into a baking tin or free standing as is. Cover with a lightly damped cloth and proof for 3.5 hours. Preheat the oven 200 degC. Once the dough goes into the oven, reduce temperature to 180degC. Bake for 20 mins. Reduce to 160degC and bake for another 10mins or so. 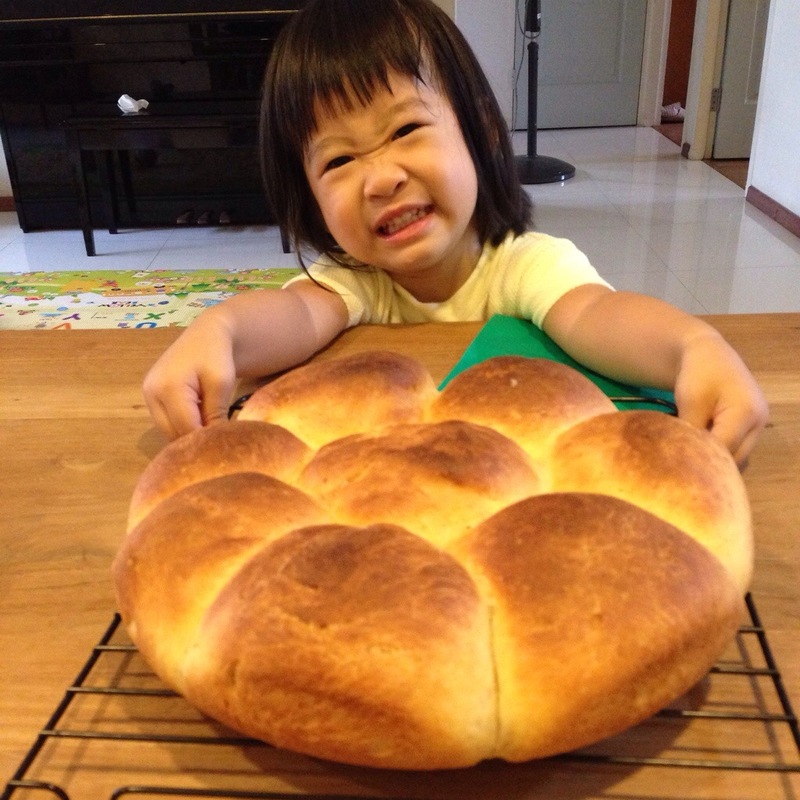 This entry was posted in Bake and tagged brioche on August 1, 2014 by three3seconds. Greenies kind of reminds me of pots of plants or even erm Martians? So that was what it was. Cake. Brownies actually, except that its literally green. Not in a bad way of cos. But because its full of awesome bitter sweet matcha amd white chocolate! Matcha and chocolate never goes wrong. 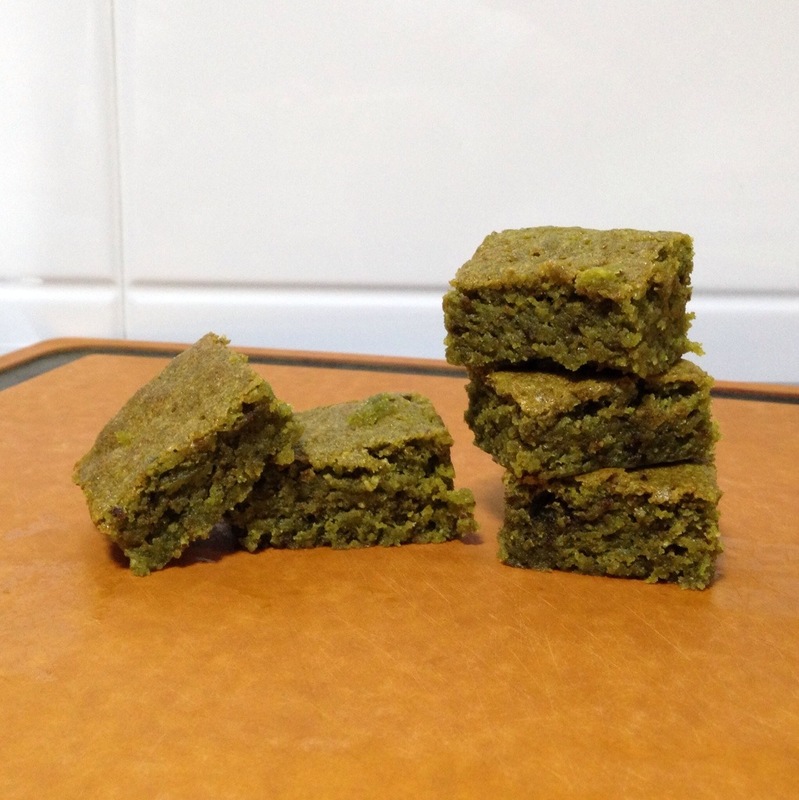 The product is a very nice melt in your mouth combination that leaves a lingering matcha after taste. Goes well with a scoop of vanilla ice cream too. Melt butter, white chocolate and sugar over very low heat or in a double boiler. Remove from heat and set aside to cool. Preheat the oven at 170 degree Celsius. Put all the dry ingredients together and mix well. Add the eggs into the cooled butter-chocolate mixture and whisk by hand for a minute or two. Add vinegar and the matcha flour mixture. Transfer to a 9 by 9 inch (or 9 by 12 inch) pan. Bake for 25 mins. 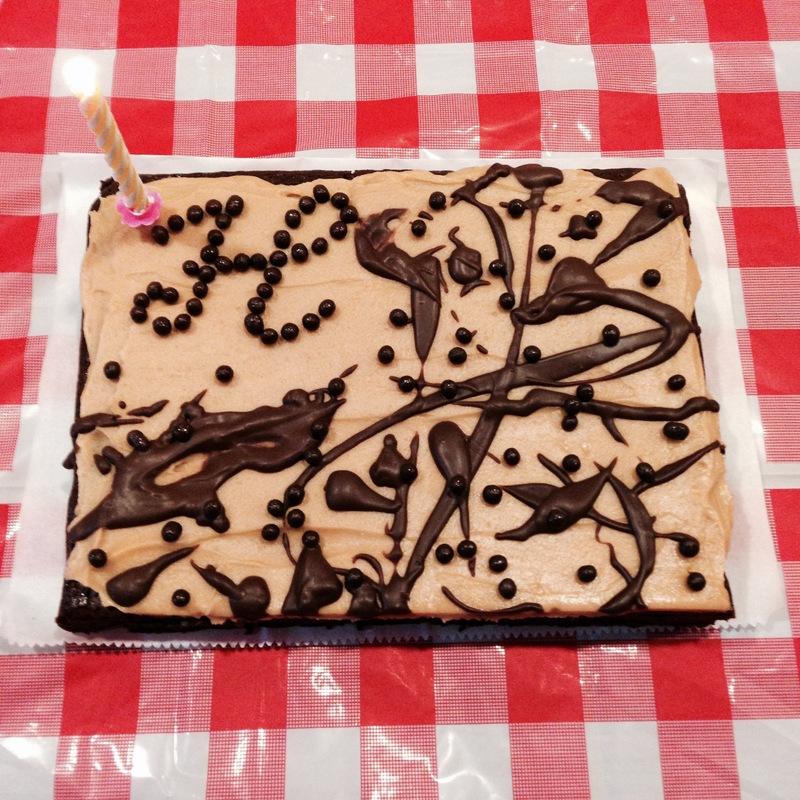 This entry was posted in Bake and tagged chocolate, dessert, greenies, sweets on May 7, 2014 by three3seconds.